Friday, June 1st, I had the opportunity to sit down with Staff Sergeant St Thomas alongside 11th grader Malik Thompson. 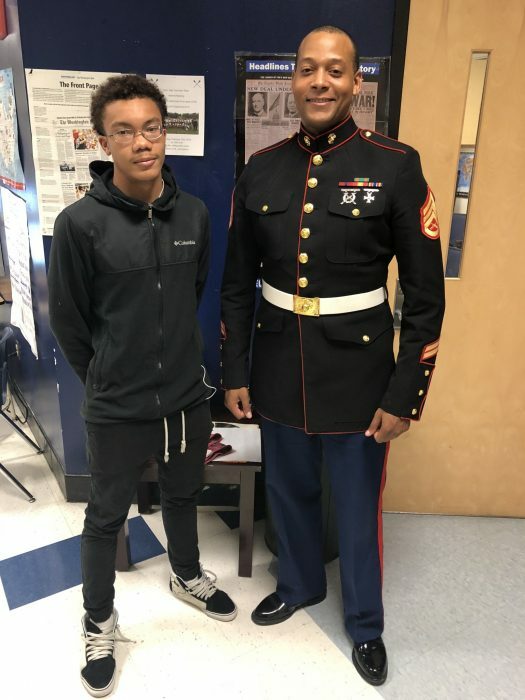 Staff Sergeant St Thomas, who is active in the Marine Corps, is in the process of recruiting the student here at Charles Herbert Flowers. If you’re like Malik and want to enlist in the Marines Corp you must be 17 years of age, a US citizen/green card holder and on the right path to graduation. The Marine Corps stresses the importance of education and checks students’ transcripts. You must be academically strong and physically healthy. Your health is important and you should be in good shape and pretty flexible. The Marine Corps has height and weight standard, they will not admit individuals who are underweight or overweight according to their guidelines. You can have tattoos and piercings as long as they fit into certain perimeters. Individuals should have a clean record with the exceptions of minor speeding and jaywalking tickets. Before joining the Marines, you take the ASVAB, also known as the Armed Services Vocational Aptitude Battery. A practice test is administered and then the official assessment. The Delayed Entry Program, also known as the Delayed Enlistment Program, incorporates recruits into the inactive reserves and includes an agreement to report for active duty, most often called “shipping out to boot camp”, at a specific date in the future. This timeframe may be anywhere from several days to several weeks, to several months. It should be noted by recruits that signing a delayed entry program is a contract and is legally binding. Take your time and make your choice! Semper Fi! For more information please visit the website below. USMC. “Marine Corps, Delayed Entry Program – When Can I Join The Marines?” USMCnet, 2018, www.usmc.net/marines_delayed_entry/.